Here's a little tool with a hook from CRKT that goes onto a key chain, which I assume is the "handle". Seeing that it lives with the car key, I suppose it qualifies as an EDC. Only a couple of dollars. Very cool. You guys have great taste in knives too. I'll play along. Been into EDC for a very long time. I have been lucky to have attained many nice things along the way. 1. Wallet — super simple, hand-made by someone on Etsy that's survived longer than anything made of leather I’ve owned, oddly. 2. Phone — currently an S5… I have a love-hate relationship with all smartphones. Additions are usually thrown into my Goruck GR1 (where the Pingo, and a titanium spork generally live by default, in the internal webbing — never gonna know when you’ll receive grub!). That bag goes everywhere I go… almost. Also, that Goruck is hands-down the best bag I’ve owned. My EDC. CRK Sebenza 21. Daaaaamn. I’ve only eyed those off over the intertubez. They look stunning; them craftmanships… so much wow. Got this Endura 4 in the mail today. I like VG10 when I worked with it. Great fit and finish and VERY sharp. Good job Spyderco. My Paramilitary 2 from them was a complete turd. whizdumb wrote: I'll play along. Been into EDC for a very long time. I have been lucky to have attained many nice things along the way. Nice looking tools you have there - tell me what's the prybar for? It's for anything and everything. Light prying tasks like paint cans, box staples, tip is sharp enough to open packing tape. I used it the other day to pry open a frozen bucket that I had my rock salt in. I used it another time to help me back out a stripped drywall anchor screw. It's handy, especially when you don't want to use a custom knife to pry stuff open and potentially damage it. My current EDC Blade is a Chris Reeve Sebenza 21 with a Ladder Damascus blade, but up until a few weeks ago it was a Spyderco Paramilitary 2 for a few years now. Before that it was a Benchmade mini griptilian, and I've tried about a thousand other knives interspersed in there. For me, my favorites are the Para 2 and the Sebenza. EDC torch has been an Olight i3 Eos for about 4 years, but just switched to a Preon 1 a few days ago actually, because the head on my i3 eos kept unscrewing from the body in my pocket (irritating). Where legal I carry my Springfield XDs in 9mm (I work in a hospital, so unfortunately it gets left in the truck a lot of the time). Also just started carrying a Fisher space pen. There are some nice friction folders out there that are made to meet that sort of law. They do not use any sort of locking retention. Got this Spyderco Manix 2 almost two weeks ago. I am very impressed! G10 scales, full length liners, good locking mechanism, and a 3inch cutting length of CPM S30V. Great materials for under $100USD. The fit and finish is top notch. The lock only took 2 days to break in. This knife is smooth operating and the ergonomics are excellent. The spring for the cage ball bearing lock is a great idea. Almost like an axis lock by Benchmade, only a more robust, and reliable spring. Good effective jimping but not overbearing. Nice choil for detail work. The cons would be weight(5oz). The pocket space it takes up is noticeably greater than a lot of knives. 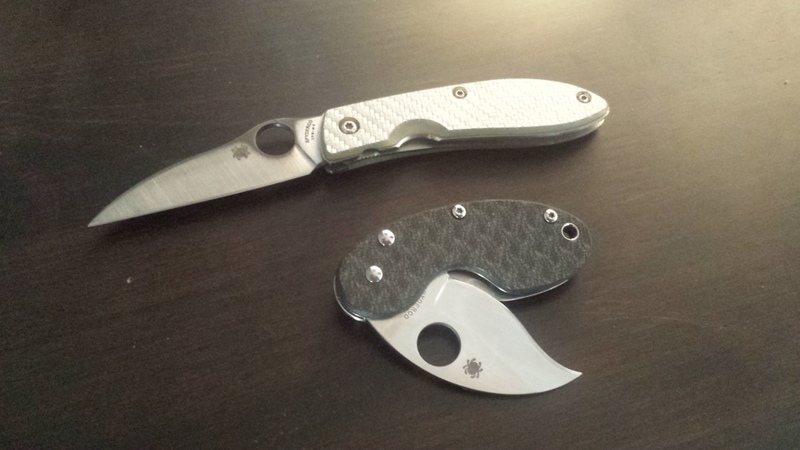 The G10 texture like the popular spyderco paramilitary 2 wears down after about 6 months of constant use. Full flat grinds are great slicers but lack strength. I favor Saber grinds mostly. Tip up carry only might not be favorable to some. All in all I am definitely satisfied with my purchase. Good job Spyderco. Currently and possibly permanently rolling with a jake hoback kwaiback uhep with custom copper back spacer. All time favorite knife full ti handles bering pivot cpm20cv blade and adjustable detent pressurer. the picker wrote: Currently and possibly permanently rolling with a jake hoback kwaiback uhep with custom copper back spacer. All time favorite knife full ti handles bering pivot cpm20cv blade and adjustable detent pressurer. In a utility knife, I'm not the biggest fan of tanto-style blades. But oh my, that is a very nice piece of gear you have there. In the past I've carried some halfway nice knives for everyday use, knives some people said I was crazy to risk damaging that way. But I don't think I'd be gutsy enough to carry that one everyday. I always seem to lose them eventually, and I might just cry if I lost a knife like that. Oh, oh, I wanna play too! These are the knives that rotate through being my edc depending on what I'm doing that day. 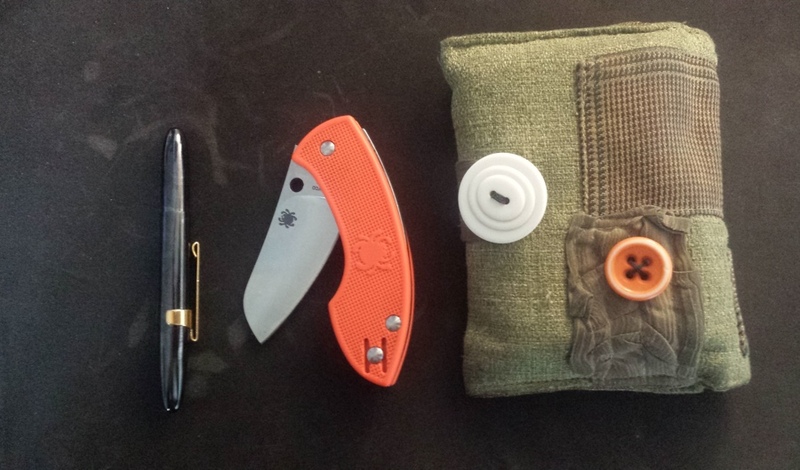 On a normal work day it will be the PM2 in the left pocket and the p'kal in the right.